Formed to foster understanding between Palestinians and Jewish Americans, the musicians of The Pursuit of Harmony also help heal divisions at home. It’s not Shabbat as usual when a Palestinian Muslim and a Nashville-based American Jew lead worship services, but amid the wave of hate crimes and harassment in the weeks since the presidential election, a 90-minute service of interfaith friendship, prayer, sharing and song held at Larchmont Temple last Friday night took on a particularly poignant significance. In the 10 days following Donald Trump’s election, the Southern Poverty Law Center counted 867 reports of harassment and intimidation against women and minorities, including 280 against immigrants, 187 against African-Americans, 100 against Jews, 95 against the LGBTQ community, 49 against Muslims, and 40 against women. While Alaa Al Shaham and Michael Hunter Ochs started The Pursuit of Harmony to foster relationships between Jewish Americans and Palestinian Muslims, it’s now clear that such bridge building is also desperately needed between Americans. But some of President-elect Trump’s divisive rhetoric during his bid for the presidency, such as his desire to create a registry of Muslims, has created a silver lining of groups coming together in opposition. Larchmont Temple’s Senior Rabbi Jeffrey Sirkman agreed. “This is about what we can do in our communities; this is not strictly a global effort but what each of us can do in our little corner of the world,” he said. “What many feel in America right now is that we are a society of strangers, but we can become a community of friends,” he added. And the diversity of the crowd in the synagogue’s packed sanctuary on Friday evening was just that. Coming together for a night of community, inspiration and hope, the audience was young and old, black and white, and Muslim, Christian and Jewish. One woman swayed, her arms in the air as if at either a rock concert or revival. Backed by Cantor Tracey Scher, and the Larchmont Temple and Mamaroneck’s largely African-American Strait Gate Church choirs, the two men led the service that combined Reform ritual and intercultural innovation; the Shema, for example, included with lyrics in both Arabic and Hebrew and Oseh Shalom ended with v’ al kol h’olam (all of the world) instead of v’ al kol Yisrael (all of Israel). Interspersed between song and prayer, Al Shaham and Ochs recalled the story of their meeting for the first time in Spring 2009 in the West Bank as participants of the Middle East Program (MEP), part of the Oslo-based Abildso Foundation. The program brought together professionals including chefs, journalists, educators and songwriters of disparate nationalities and religions to bond over the common language of their work. Ochs met Al Shaham on his very first night in Ramallah. 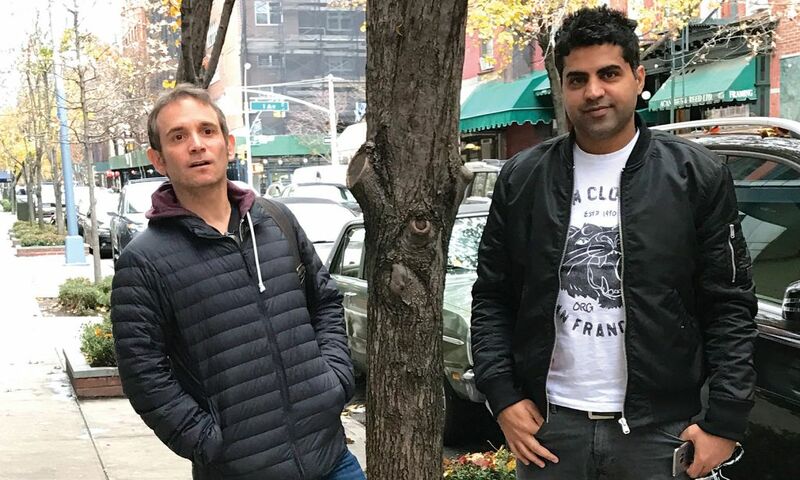 A musical relationship between Ochs and Al Shaham ensued, meaningful dialogue eventually occurred and an enduring friendship born. They have travelled in earnest as The Pursuit of Harmony since 2014, telling the tale of their unlikely friendship on American college campuses, in churches and in over 30 synagogues across the U.S.
Al Shaham and Ochs shared more about their lives on a recent afternoon at the Upper East Side’s Second Avenue Deli. Ochs ordered a vegetable omelette, a bowl of consomme with rice, and French fries; Al Shaham opted for the “crispy” chicken fingers. Like old friends sometimes do, Al Shaham took a few fries off of Ochs’ plate. In the iconic Jewish delicatessen, Al Shaham tasted a square knish for the first time. Al Shaham, 36, was born in the Al Hussein refugee camp in Jordan. At 16 he moved to Gaza where he went on to study civil engineering at The Islamic University of Gaza (The only other university in Gaza, the more moderate Al Azhar, did not have an engineering program, Al Shaham said.) After a six-month stint post-graduation as an engineer, Al Shaham left the profession as he found he was “more attached to people than construction.” After Hamas took over Gaza in 2007, he moved to the “more liberal” Ramallah in the West Bank. 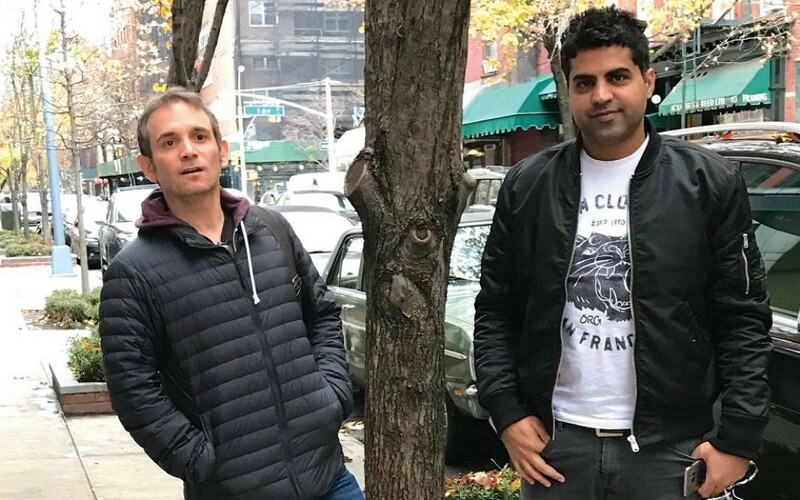 Al Shaham is also a commentator, political satirist and poet whose three music videos, “Bidna,” “Let’s Live for Palestine” and “Welcome Obama” have garnered approximately 1.6 million views combined on social media. When not touring with The Pursuit of Harmony, Al Shaham works in both the West Bank and Oslo for Abildso. At the deli, he was too humble to mention his 2014 Children of the Earth prize for his work with youth in conflict zones. Michael Hunter Ochs grew up in Larchmont, and attended New York University before pursuing a career in music and songwriting that has since brought him to Nashville. He has written for Josh Groban, won Song Of The Year for “On My Knees” (performed by the Strait Gate Choir on Friday evening) from both the Gospel Music Association and the Nashville Songwriters Association International, writes lyrics for European music artists, and is a composer of Hebrew and Jewish worship music. He is also the composer in residence at Congregation Micah in Nashville when not touring with secular music pursuits or with Al Shaham. “The perception we have [of Palestinians] doesn’t meet the reality on the ground,” Ochs said to the congregation on Friday evening. A Reform Jew who coincidentally went to religious school at Larchmont Temple, Ochs had never been to Israel until his 2009 participation in MEP. He has since been back 25 times and has his favorite hotels to stay at in Ramallah. “We tried to kidnap him twice, but his parents wouldn’t pay for him,” Al Shaham joked to the crowd on Friday night. The two have visited Yad Vashem and refugee camps in the West Bank together. It was clear after the service broke up that most who attended were moved in some way by the evening.